Recover Corrupt, Deleted Data from Virtual Hard Disk (VHD/VHDX) Files. *Download trial version and save recovered data upto 250 MB free. I was able to recover all the files with the folder structure same as it was in the corrupted VHD. No alterations and no renaming of files or folders as is the case with other file recovery tools I have used before. I was unable to recover my vital data from my damaged virtual hard disk. But, after I got your amazing tool, I was able to restore VHD data successfully. Thank you for developing such terrific software. It was really a very critical situation for me to get back my VHD data. My friend told me about your tool which delivered an outstanding performance and recovered my deleted data. It was a wonderful experience for me. Thank you! 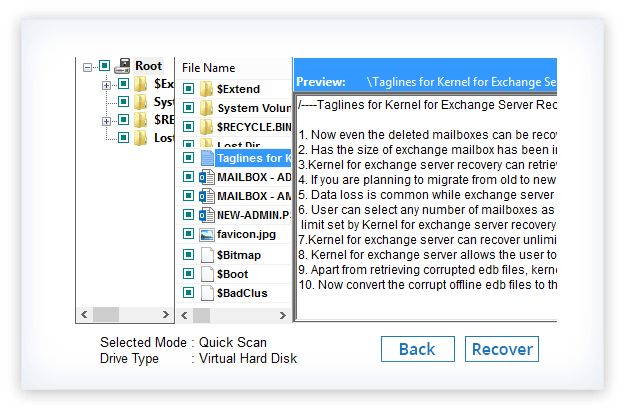 VHD recovery tool retrieves your lost and permanently deleted files, soon after repairing the corrupt VHD partitions. It then allows you to restore all types of files, (such as: archive file, graphic files, internet files, database files, document files, media files, email files, etc.) in a single attempt. The software helps to find your specific type of file in a matter of jiffies, amongst the thousands of miscellaneous recovered files. The user has to specify the desired file type (like *.xls, or *.doc) to extract the same type of files as the result. Virtual hard disk recovery tool to repair the corrupt or damaged VHD/VHDX files by performing an in depth scanning of the files. In fact, the tool is well included with three sophisticated data recovery modes: Quick Scan, Extensive Scan and File Trace, which allow you to restore VHD/VHDX files in any extreme conditions. 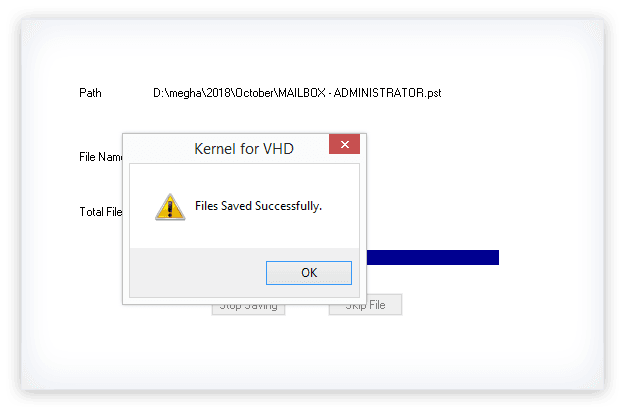 Kernel for VHD Recovery software supports VHD file created in Hyper-V Server, Windows 10, Windows 8, Windows Server 2016, Windows Server 2012, Windows Server 2012 R2, Windows Server 2008, Windows Server 2008 R2, Windows 7 and Windows Vista. Also, it supports both FAT and NTFS file systems for VHD files. Recover your lost files and folders using ‘Settings’ feature that offers various options like sectors to be read in one attempt, include/exclude deleted files from recovered data, rename/overwrite/skip duplicate entries etc. While you use this software, there are few simple steps that you have to follow for recovering VHD data. You don’t need any technical expertise to use it. When you run it, it asks you to select scanning modes and select VHD to extract inaccessible data and it recovers all crucial VHD data. SelectSelect the VHD or VHDX files from the system location and perform Scan with any out of three modes. PreviewView the recovered items from the selected partition of VHD/VHDX files. SaveExport recovered items successfully to your desired destination. How can I recover VHD/VHDX files with VHD Recovery tool? 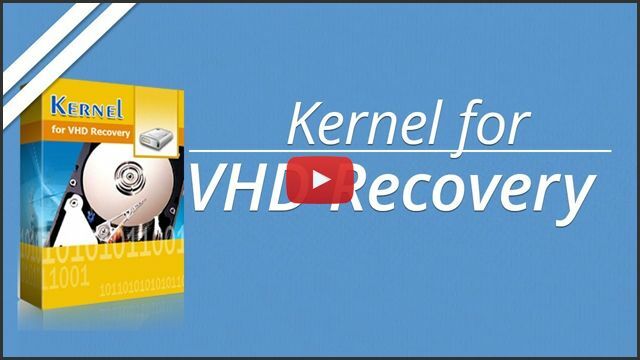 Download, Install and Launch Kernel for VHD Recovery. 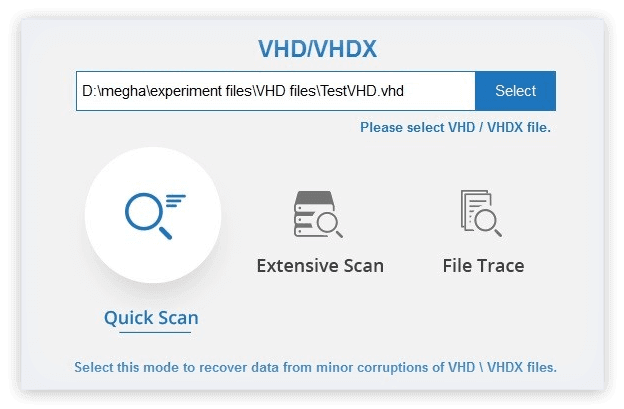 Select VHD/VHDX file and choose any recovery mode amongst Quick Scan, Extensive Scan and File Trace depending on the level of corruption. Select the VHD/VHD drive that contains your data and click Next. Now, select the VHD partition from the left pane and click Scan. At the end preview the recovered data and click Recover to save the VHD/VHDX data to a desired location. 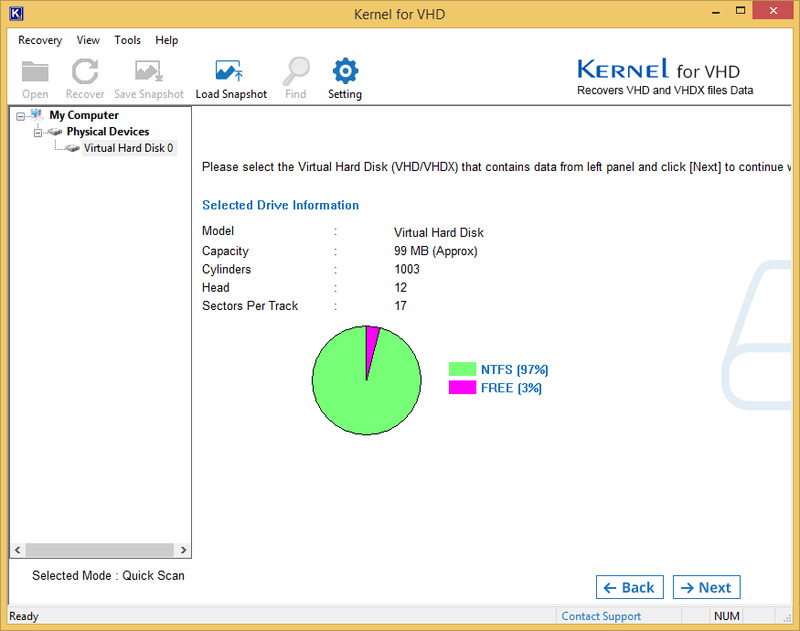 Why to look for Kernel for VHD Recovery Tool? If you are looking for the best alternative of any inbuilt tool that can offer you the best result of VHD recovery, then Kernel for VHD recovery is the best option. It is equipped with advanced algorithms that empower it to perform a quick and accurate recovery of VHD data. Whatever is the reason of VHD/VHDX file corruption, it recovers all data by maintaining data integrity intact. Does it support all VHD files created by various utilities? Yes, it is much capable to repair and recover entire VHD data from virtual hard disk, created by using Windows Server 2016, Windows Server 2012 R2, Windows Server 2012, Windows Server 2008 R2, Windows 10, 8.1, 8, 7 and Hyper- V server. Accidentally, I formatted the FAT 16 file system of VHD. Is it possible to recover file system data with the help of this software? Yes, it is possible to recovery all your lost FAT 16 file system data with the help of our software Kernel for VHD Recovery. Also, please make sure that the files is FAT or NTFS only otherwise the tool might not work for you. How to get rid of error message “Failed to open attachment 'C: \directory\MyVHD.vhd'. Error: 'The file or directory is corrupted and unreadable.”? This is very common error message when VHD/VHDX files become inaccessible due to corruption of VHD storage media. This serious error cannot be eliminated by any ordinary inbuilt tool. 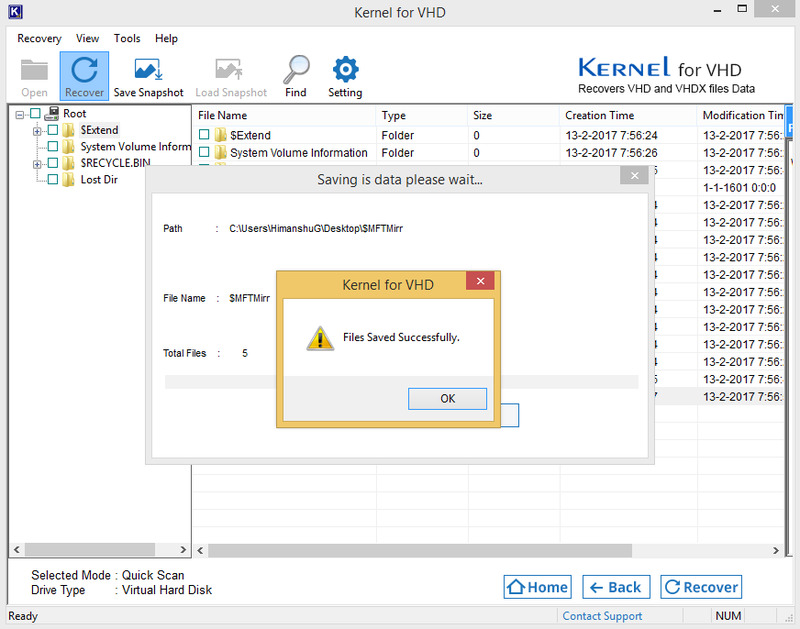 You can get rid of this severe error by using a professional recover VHD tool like Kernel for VHD recovery. The Virtual Server I was using is failing to start my machine, it seems like VHD got damaged or corrupted due to some reason. What is the possible solution for this issue? 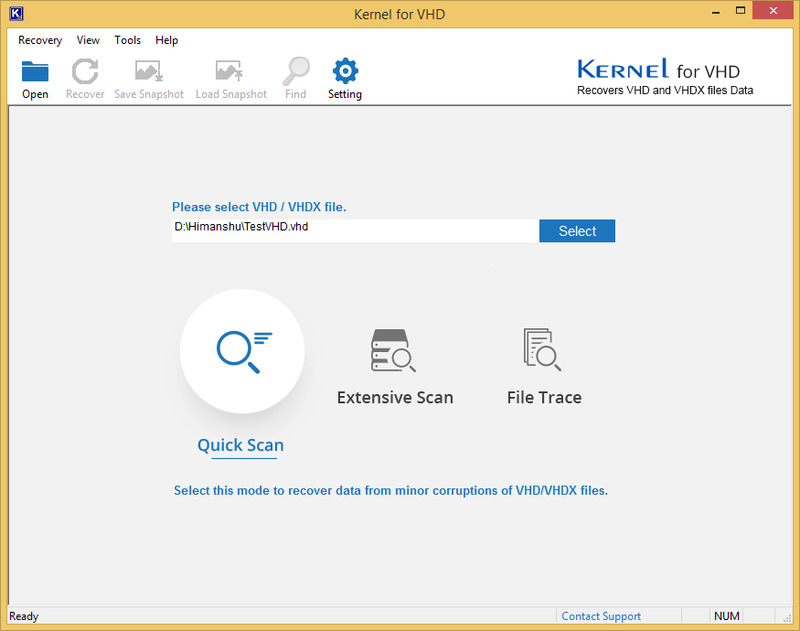 The Kernel for VHD Recovery tool is specially designed to deal with lost, damaged, deleted or formatted, corruption issues of VHD files. If you think that Virtual Server is failing to start your machine due to VHD corruption, then we highly recommended you download the trial version of the software to make sure that VHD file data can be recovered or not. Do you provide any discounts to Educational Institutes? Yes, we do provide discounts to Educational Institutes. You can take detailed information about Offers and available Discounts by mailing at sales@nucleustechnologies. You need mention your requirements, number of systems on which you will be using the software and name of the product. You can also contact Support team via Live Chat Support for more details. Does the trial version saves any recovered data? Yes. The trial Version of the tool can now save up to 250 MB of recovered VHD and VHDX files data to the specified destination. Selecting the VHD/VHDX files and then choosing the desired scanning mode. Selecting the desired drive to recover. Selecting the corrupt partition for recovery. Preview the recovered data prior to saving. Successful saving of recovered file items to the required destination. 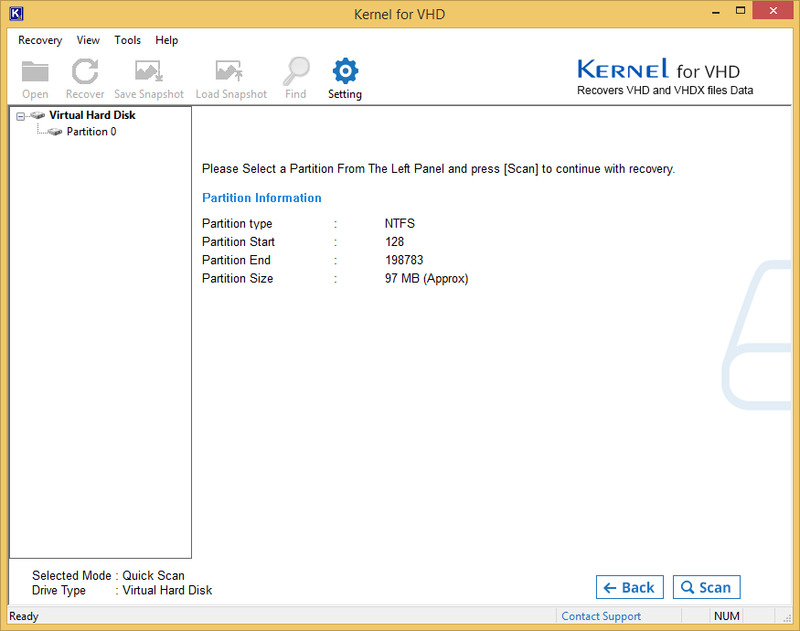 Kernel for VHD Recovery tool has been upgraded (18.4) with more interactive GUI and improved features. Now, it has more powerful QFSCI algorithms that provide efficient recovery from corrupted VHD and VHDX files. The Trial Version of the tool now allows saving data up to 250 MB for free. Along with that, it supports all Windows and Windows Server versions. Kernel for VHD Recovery tool has now become more powerful, with the introduction of new feature in the version 17.1. The tool now supports VHDX files for the data recovery, and runs perfectly on Windows 10 supported computing devices. 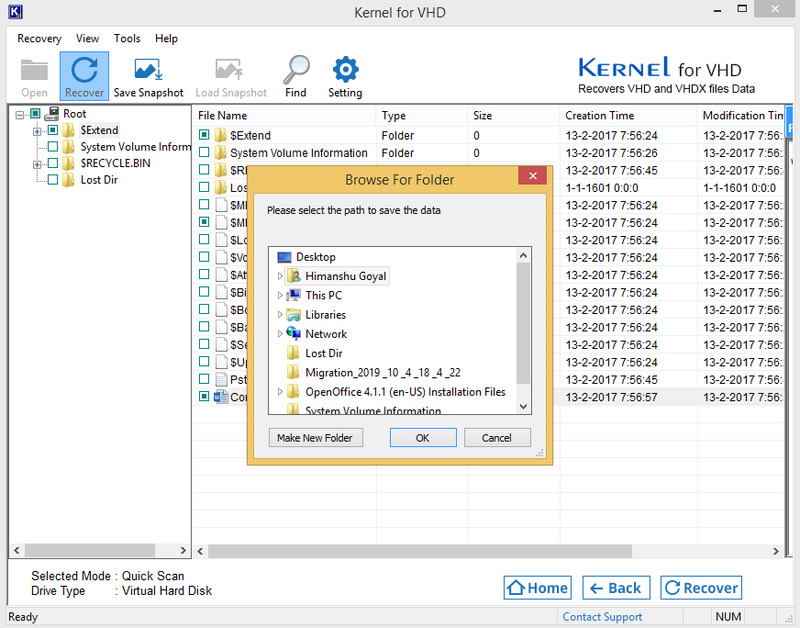 Lepide Software announces the release of Kernel for VHD Recovery- a portable and cost effective solution to recover files stored in the Virtual hard disk of computer. This is another impeccable tool by Lepide software that has the potential to ensure successful recovery of corrupt, damaged and inaccessible VHD files. With various effective and robust recovery modes, it leaves no stone unturned to repair VHD files. Fix corruption errors from logical and physical devices in Windows.